“Do you remember where you were on March 13, 2013? I bet you do. It was the day that Jorge Bergoglio was introduced to world as Francesco. Although rumoured to have been a close second in the previous conclave that elected Pope Benedict, Cardinal Bergoglio was a relative unknown and was on no list of the pundits for the 2013 election. I remember where I was when I heard the news, and I remember my first words: “Who?” and “Francesco!” Although he would go on to explain his choice of name based on his love for the poor, my first thoughts were that this man was declaring himself to be a reformer after the saint who heard the Lord say to him, “Francis, rebuild my house, which as you see is falling into ruin.” I like to believe that he chose this name for both reasons, and his actions so far as pope would confirm this hope. 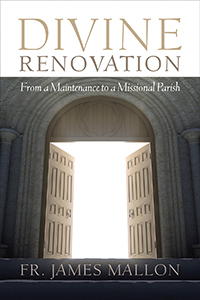 –Divine Renovation: From a Maintenance to a Missional Parish, Fr. James Mallon, Novalis Publishing, 2014.